Men's Haircuts: Local Barber or Chain Clipper? As a youngster, my grandfather always took me to the local barbershop to get my crew-cut. As I grew up, I'd go alone to the local barbershop every month or so. By the time I was in college, I went to this "specialty" barber in Seattle called Billy Shears (in tribute to the Beatles' song)--paying from around $10 to $25 from the late 1970s thru the 1980s. By the 1990s, I was going here and there--nothing in particular. For about the past 10-15 years, I have been going to Great Clips and the like, paying around $15 plus tips. Today, I again went to my local Great Clips chain shop. But on a morning walk before I went there, I passed by a local men's barber shop with that old revolving red-white-and blue barber pole. "Walk-ins welcome," it said. I haven't been to a mom-and-pop men's barber shop in ages. I used to go to a salon years ago, however, the hair stylist had a baby and decided to work from home so she could take care of her new son. She converted the garage to a mini salon and I go to her home. I have been going to her about 20 years, 10 of which in her home salon. The haircut is the same and I never have to wait. It is worth seeing when a city boy is visiting Grandma and Grandpa and is sent comes in for a haircut. It's probably the highlight of Grandpa's day. Kid says he wants some of this and some of that and walks out with a crew cut. I cut my hair myself most months. When I want it to be fancy, I go to the local barber shop. I like the vibe of a local shop much better than the chains. Local barber. I read the Sports Illustrated and listen to Frank Sinatra on the stereo, and then Joseph cuts my hair too short for my young wife's liking (I think it's just fine). BTW: I get my hair cut every four months or so. How often do my FIRE brothers get their follicles trimmed? F. goes to a small old time local barber shop, with the red and white barber pole and all. The barber there does a pretty good job, and doesn't charge much. 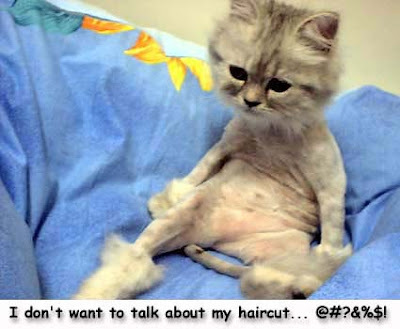 I suggested he could try Supercuts, where I get my hair cut, but he prefers a barber shop. I've cut my own hair for over 50 years -- I'm much too tight to pay a barber. No one who sees my hair has been so impolite as to criticize my work, and it looks okay to me. I just lift the hair between my fingers and cut it at a uniform length from my scalp. I don't even need to look any longer, as I work. Takes 10 minutes every couple of weeks. I used to go to Rudy's and get the buzz, but I figured out that 6I can buzz myself just as well. When my dog died I cleaned up his Andis clippers, and use a #2 comb (1/4") every few weeks. I used to let it grow longer in winter, and then I would have to get $20 cuts from time to time, but it has been so much warmer recently that I am comfortable all winter with the buzz. I go to our local barber ($8.75 plus tip). Two gals and one guy, all over 55. Good conversation, no hip-hop music, etc. The Great Clips etc usually don't employ barbers, and it seems that "real" barbers do a better job at cutting my hair (no lines, looks even, don't cut it too short in back so it stands up, etc). When I travel I also seek out a barber, but it's interesting that there's no consistency regarding price--it might be $7, it might be $20 for the same cut. I go every 2 weeks. I go to Great Clips, Super Cuts, or any of those places that provide a coupon, so i usually pay about $10 + tip. I have been geting the ears lowered about every 6 weeks, but now that ER is at my doorstep, I'm going to get it cut shorter next time and try to go for 2 months between clips. For $80 a year, I was thinking of buying a clippers and getting the DW to do it, but it's not worth it. Kind of like changing your own oil in the car. I used to do it myself, but for $20, I would rather let somone else get dirty while I read a magazine. Local barber? I don't think I have ever seen a barber shop here. I go to the chain clipper at Walmart. In and out in 15 minutes. Minimal talking. Suits me just fine. I go every 3-4 months and do some minimal maintenance with a trimmer in between visits to keep it looking clean. There is really a big difference. It isn't the money, it's when you look into the mirror before you get into the shower and notice that you are beginning to look like the Sasquatch, you just pull out the clippers and in 5 minutes you are done. Then you get rid of all those tiny itchy hairs in the shower, and you can do it weekly if you want instead of waiting until you are looking pretty messy. Did you know that the song "The First Cut is the Deepest" was written by CAT Stevens? My barber is local. Very very local. Shhhhhhh! I've been having fling with my barber for many years now! Woohoo! I use one of these..
enough that it works well with very little skill involved. I just buzz it over my head every few weeks. super easy and no-hassle. i would do it this way even if i could have free haircuts wherever i wanted. If i wanted my hair longer than 1/2 in. then that would be a different story i guess. Local barber, charges $8, $2 for a tip and he's done in 10 minutes. And he tells good jokes. When the grandson comes for his summer visit, he knows the first stop is the barber. He gives up his shaggy looking city kid weird haircut look for a buzz cut. He likes a buzz cut - it's just the city kids would make fun of him if he kept it during the school year. The kids these days don't even know what butch wax is... unless they're using it to spike their hair.